KILDARE GARDAÍ HAVE encouraged filling stations to be on alert after a number of filling station drive-offs using cars with false plates. It is understood that two drive-offs occurred in the Naas area over the past two days, with two more suspected drive-offs today. A garda source said they believe that different people carried out the drive-offs. “It’s the usual crack – they go in, load up. False plates, false everything and that’s it,” they said. Yesterday, a filling station in Kill was targeted, while a service station in Prosperous was targeted today. In Prosperous, the car in question had false plates. The driver took €130 worth of petrol. A garda spokesperson said that the Prosperous incident occurred at around 3pm. The owner of a security company told TheJournal.ie that a filling station owner in Kildare Town told him that a drive-off occurred at their premises today, and they had reported it to gardaí. 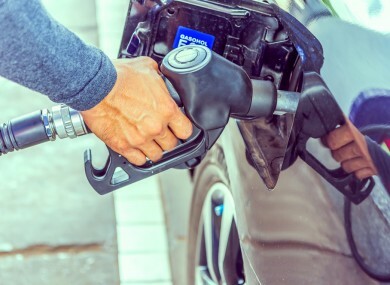 A member of staff at an Allenwood filling station confirmed tonight that they had also been struck by a drive-off today, where the person helped themselves to diesel before leaving without paying. The garda source said that sometimes the false plates are in fact doctored plates, where one or two of the characters is changed by using black masking tape. In Kildare, filling stations owners have been informed by gardaí of the risks of drive-offs. While there appears to have been a spate of them this week, they were also taking place last year, and the garda said that such drive-offs occur around the country. Email “Kildare gardaí on alert after filling station drive-offs ”. Feedback on “Kildare gardaí on alert after filling station drive-offs ”.